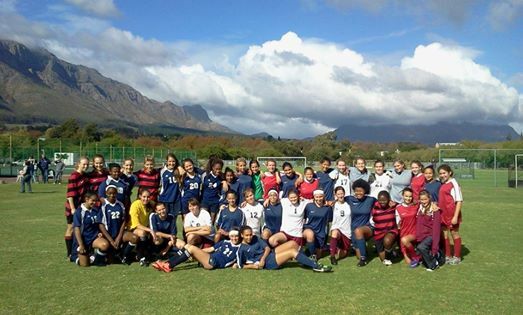 We have been investing into girls’ and women’s football development in Stellenbosch since 2007. We have started girls football teams across the different high schools in the area. Today many of the players have achieved provincial and national level and many are playing for local and foreign universities and clubs. The picture above is of one of our annual events where players from Rhenish Girls’ High, Bloemhof and Stellenbosch High participate in. We look forward to many more events in this coming year, including Futsal, Beach Soccer and Football tournaments among the different local schools. We, along with Ubabalo, CSV Construction and Maties Community Service (MGD Stellnbosch University) have been organising the VriendsCUP (the Friendship Games) since 2010. What makes the VriendsCUP so unique and the first of its kind, is the fact that teams are mixed, and not from only one school. The main purpose of the VriendsCUP is to build bridges and to develop interaction between the learners, parents and teachers of schools in the various local communities. Therefore, none of the participants need to be excellent sportsmen or women. Any learner that wants to have a go at a new sport, get some game time or simply make new friends while kicking or throwing a ball around is welcome. We have been using this opportunity to expose the learners to concepts such as diversity, acceptance, gender equality, respect and team work. The feedback from the community in general has been very positive. We plan to expand the Games to other areas in the Western Cape and other provinces in the coming year. As part of CSV Construction’s community project, we have been building sand courts in and around Stellenbosch with the purpose of promoting sport and recreational activities, wellness and mass participation. With the water restrictions and scarcity, the sand courts provide an alternative sport and recreational facility with almost no maintenance costs. Investing in these facilities ensures that communities can engage in sporting activities year-round. Three schools, namely Rietenbosch and Klapmuts Primary and Luckhoff High School have already benefited from this initiative and the feedback from the principals, teachers, coaches, parents and learners is very positive. The plan is to build another two facilities in 2017.